Our Exceptional Staff: Kerianne Hopkins, Gina Narcise, Stephanie Sargent, Karen Myers, Beth Sadler and Debbie Patterson. Beth has been a member of the Main Line Dental Team since 1977, initially as a chairside assistant and presently as office manager since 1993. Beth gets tremendous satisfaction from her long-term relationships with our patients and working with well-trained and happy staff. Her goal is to help make every patient visit positive and comfortable experience. Beth enjoys practicing yoga, reading and traveling. Gina received her Dental Hygiene degree from Temple University in 1984 and her BS in Dental Health Education from West Chester University in 1990. Gina is dedicated to helping her patients improve their health by providing them with the best preventive dental care possible. She enjoys the friendship and bonds she has made over the years. Gina loves spending time with family and friends and traveling. Debbie received her degree as a Registered Dental Hygienist from Harcum College in 1993, and then graduated from Pennsylvania College of Technology with a B.S. in Health Policy & Administration in 2000. 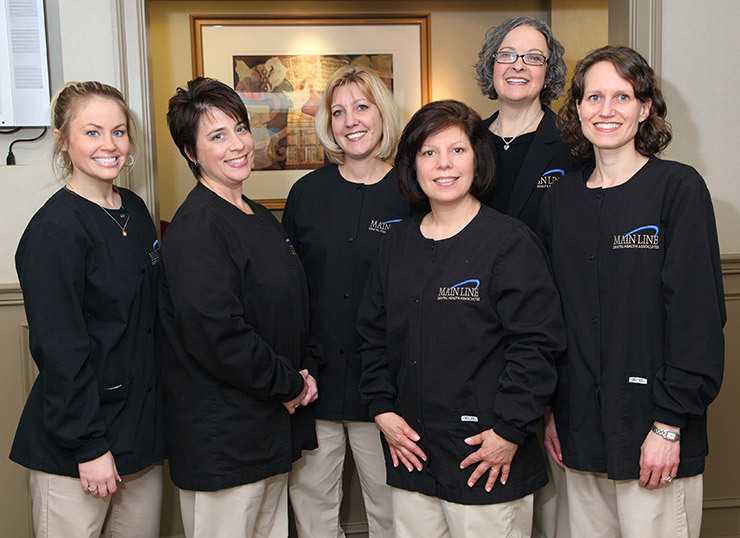 She has been a member of the Mainline Dental Team since 1998 and has been in the dental field for over 16 years. She is very committed to helping patients reach and maintain optimum dental health. She enjoys spending time with her son Jack, daughter Erin, and her husband..
Stephanie has been with Mainline Dental since February 2000. She received her EFDA certification from Harcum College in 2002. She is married and has 2 children. Karen has been practicing hygiene for over 20 years! She loves being part of the team and cares deeply for her patients. Karen is happily married with a son Kenny and daughter Alyssa. Kerianne started working at Mainline Dental in June 2006. She received her CDA from Harcum College in Bryn Mawr, Pa. and completed her internship at Temple Dental School. She enjoys seeing the amazing transformations of cosmetic dentistry first hand, working with a well-trained and experienced staff and providing our patients with the utmost care and respect. I have been a patient since Dr. Snider began his dental practice here. Because I have unusual tooth and gum sensitivity, I need a dental expert who can provide services and perform procedures without causing pain. My dental appointments have been pain-free for years. Anyone who wants a superb, pain-free dentist will be very happy they found Dr. Snider. He is kind, understanding and gentle. I come from a medical family on all sides so I am very selective in who I go to for medical and dental care. Dr. Jeff Snider is a top flight, first-class professional and one of the nicest human beings on the face of this planet.